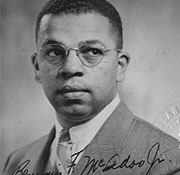 Home » Historic Preservation » Research and Technical Preservation Guidance » Architect Biographies » Benjamin F. McAdoo Jr.
Benjamin Franklin McAdoo Jr. holds the distinction of being the first African American architect to maintain a practice in Washington State. During his time in the state, he was a local civic leader and national advocate for the advancement of low-cost housing solutions. Additionally, many of his Seattle area residential designs achieved local acclaim. During the three decades of his prolific and diverse architectural career, McAdoo designed numerous churches, single and multifamily dwellings, commercial and institutional works. Born in Pasadena, California on October 29, 1920, McAdoo’s formal architectural education began at the University of Southern California. He then transferred to the University of Washington to complete his bachelor’s degree in architecture in 1946. His early projects were small in scale and included many community churches, building renovations, and private residences. Some of his innovative designs were published in The Seattle Times. This publicity led to many other local commissions. His style, a synthesis of modernism and regionalism, proved popular in Seattle. Like many other architects, McAdoo's personal residence (1958) in Bothell is a premier example of his ideal residential formula. Other notable residential designs include the John P. Browning House (1947) in Seattle, the Donald Hochberg residence (1954) on Mercer Island, and the George Hage House (1956) in Seattle. McAdoo’s interest in low cost housing led to an administrative position with the United States Agency on International Development (AID) in Jamaica (1961-62). While there, McAdoo promoted a modular house design which could be easily assembled by unskilled workers. The successful design was widely manufactured within the country. Upon returning to the United States in the early 1960s, McAdoo worked in Washington, D.C. where he helped to set up the Latin American Division of the AID before transferring to the General Services Administration’s Public Building Services. McAdoo returned to Seattle in 1964 and worked in the Auburn office of Public Building Services. Concurrently, he maintained a private office in Seattle, eventually resuming a full-time practice in the late 1960s. His later work included many public, civic, and educational buildings such as the Southcenter Branch of the King County Central Blood Bank (1970), the University of Washington Ethnic Cultural Center (1972), the Queen Anne Swimming Pool (1978), and Seattle Fire Station No. 29 (1972). McAdoo worked steadily until his death on June 18, 1981.